One of the earlier posts I wrote for this site was last year, looking at attendance in the Big Sky and wondering if there was a problem. 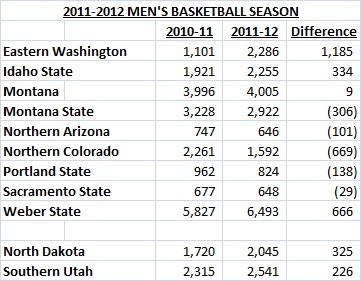 Well, according to the attendance figures released by the NCAA, the Big Sky's attendance was up this year! Two years ago, the Big Sky was 20th out of 31 conferences in attendance with an average of 2,288 fans per game. Last year, the Big Sky moved up to 18th out of 31 conferences in attendance, and had an average of 2,532 fans per game. That is a pretty impressive increase. Since I like spreadsheets so much, here is a team breakdown of the last two seasons, which should help see the team-by-team comparison very easily. There are not too many surprises here. Not counting North Dakota and Southern Utah, four teams increased attendance, and five team decreased. Let's look at it. - Eastern Washington got a boost of energy from new head coach Jim Hayford, and it certainly showed. They had the biggest increase in attendance, more than doubling the number of fans per game. Hayford has energized the EWU fanbase, and it wouldn't be a surprise to see that number continue to rise in the future, especially if they are able to have success this year with a lot of newcomers. - Idaho State has a very passionate fanbase, and they were certainly energized by the great run that the Bengals had under Deane Martin. For the first time in awhile, they were relevant in the Big Sky, and it was good to see that reflected in the attendance. - Montana stayed very steady, obviously. That should remain up this year, and hopefully rise a bit as the Grizzlies will be the preseason favorite. - Weber State was helped by a full year of Damian Lillard. Certainly he was worth the price of admission every night, and lots of fans turned out to see a talent like is rarely seen in the conference. He was likely a reason for the boost for the conference as a whole, as opposing fans enjoyed seeing him also. - Montana State was down 306 fans per game, as the fanbase becomes more and more disenchanted with head coach Brad Huse. It didn't help that they had a ton of new faces, and should again this year. This is a make or break year for Huse, as he is approaching the end of his contract and the fans are getting restless. - Northern Colorado had a historic year the season before. It is not a surprise that attendance dropped a lot, since they lost many graduating seniors and recognizable faces, as well as the simple fact that they were not as good of a team as the year before. As they get back to the winning ways and being back in the top half of the conference, I suspect this number will get back to what is was in 2010-11. - For Portland State, Northern Arizona, and Sacramento State... we don't need to sugarcoat it. Those attendance numbers are pitiful. Granted, all three teams play in small arenas (or at least, NAU does depending on where they play), but those attendance numbers are pretty pathetic. Northern Arizona just barely took the crown for lowest attendance. Fortunately, there is hope for all three... Portland State is improving their arena, and they look poised to consistently compete. Northern Arizona should have some extra excitement with new coach Jack Murphy, and he will hopefully get them competitive again. Sacramento State should have their best team in years this season. Hopefully we will see all three teams rise in attendance. For the two joiners... North Dakota increased, and hopefully that number will go up again in their first season in the Big Sky. Southern Utah may have a difficult time reaching that attendance number again. They are moving from a solid conference in the Summit League, and they could struggle in head coach Nick Robinson's first season. The attendance numbers really aren't so bad, and the positive aspect is that all, more or less, are capable of improving those numbers. Sacramento State needs to do something to improve their arena - I still believe they are a sleeping giant in the Sacramento market (especially if/when the Kings relocate). That's great news about Portland State - they are another who would benefit greatly from an improved venue with increased seating. Isn't NAU in the process of renovating its fieldhouse, thus providing them with a 3,500 to 4,000 seat venue? I have found all kinds of news items which indicate it was approved, and I have even found links to construction/architect firms - I just haven't seen anything to indicate it's actually happening. It looks like you are right about NAU... they have been in kind of an interesting situation. Hopefully MTJack can come on at some point and make a comment here... I know they have been playing in the Rolle Activity Center which is pretty small... I can't remember if they are playing there for a better atmosphere (as opposed to a bigger, less full arena), or if they are waiting on the renovations to finish. Hopefully MTJack or another NAU fan can comment and shed a little bit better light and understanding.